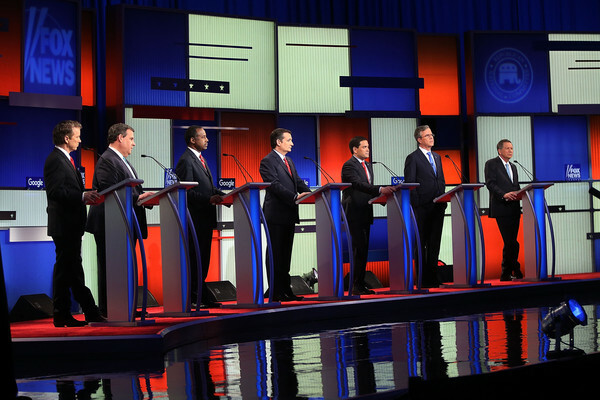 Republican presidential candidates (R-L) Ohio Governor John Kasich, Jeb Bush, Sen. Marco Rubio (R-FL), Sen. Ted Cruz (R-TX), Ben Carson, New Jersey Governor Chris Christie and Sen. Rand Paul (R-KY) participate in the Fox News - Google GOP Debate January 28, 2016 at the Iowa Events Center in Des Moines, Iowa. Residents of Iowa will vote for the Republican nominee at the caucuses on February 1. Donald Trump, who is leading most polls in the state, decided not to participate in the debate.